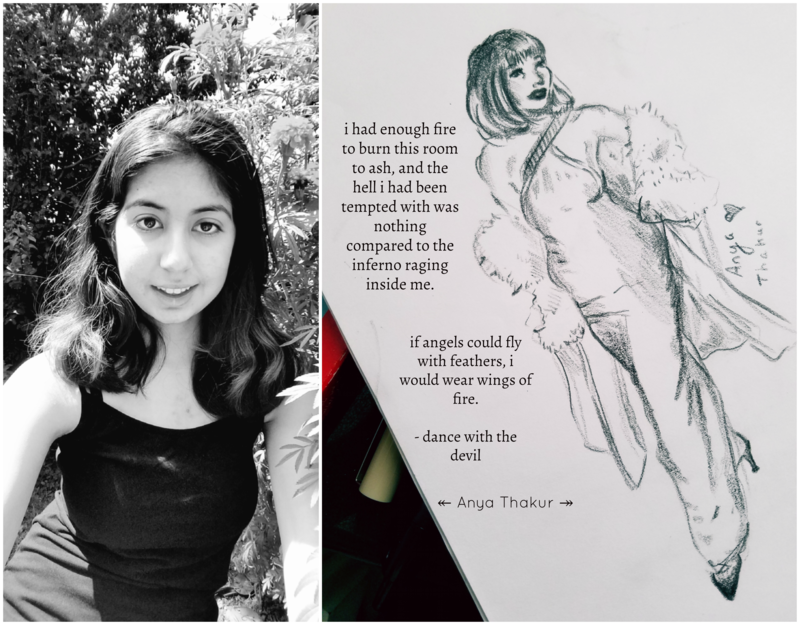 “Dance with the Devil” is a poem written by 14-year-old poet and women’s advocate Anya Thakur. She works to empower and uplift communities as founder of GirlUp Dallas, a UN Women organization, and a MetoWe partner with ArtRising, which provides arts enrichment to underprivileged communities and creates diverse programming for South and East Asian women. Hosting education, self-defense, and language and literature classes to empower rural women in Delhi, Mumbai, and Munipur, and humanitarian efforts with Myna Mahila, which empowers women in rural India through health education, her women’s advocacy promotes UN Women’s mission to ensure a fair and equitable future, and she has traveled throughout the United States and India to speak for girl’s education and empowerment.